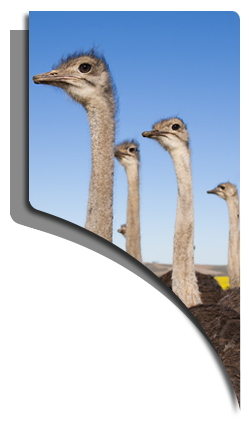 The Ostrich ration range has been specially designed for farmers who produce ostrich for the live market between 6 – 9 months of age. This ration does not contain a coccidiostat or growth promoter, nor does it contain animal by-products or hormones. Feed ad lib. from day old to 4 weeks days of age. 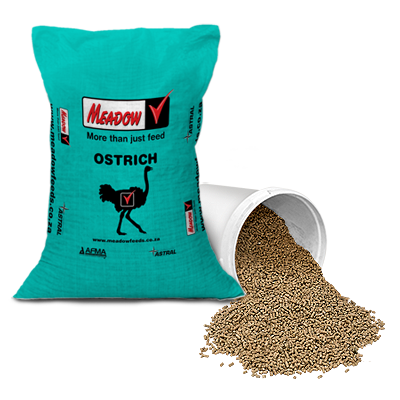 The Ostrich ration range has been specially designed for farmers who produce ostrich for the live market between 6 – 8 weeks of age. This ration does not contain a coccidiostat or growth promoter, nor does it contain animal by-products or hormones. Feed ad lib. from day old to two months of age. Feed ad lib. from two to six months of age. Feed 2kg per day from six months of age to slaughter. The Ostrich Breeder has been specially designed for farmers who produce ostrich chicks for the rearing market. This ration does not contain a coccidiostat or growth promoter, nor does it contain animal by-products or hormones. Feed 2kg per day to breeding ostriches. The Ostrich Maintenance has been specially designed for farmers who breed with ostriches outside the breeding season. This ration does not contain a coccidiostat or growth promoter, nor does it contain animal by-products or hormones. Feed 2kg per day to breeding ostriches outside the breeding season.